Attention: The contents of this mod are not made by me but were made and previewed by Tweevle in RAD-82's post 'Previews from the impatient' pages 7 to 9. He has no role in the making of mod and I want to make it clear that the portraits shown in this mod, with exceptions, are his work and not mine. 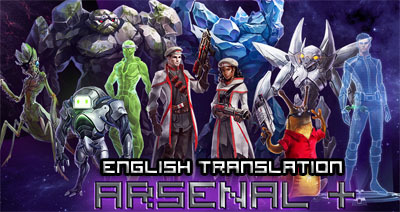 The Arsenal+ Dev Team - The human hat sprite was from Arsenal+, permission granted by Bamalf and Mr_Easy_Money however the sprite was created by someone in the team. Corn - A lot of improvements were created by the user Corn. These improvements are the engi portraits, the rockman robe sprites and the slug hat sprite. 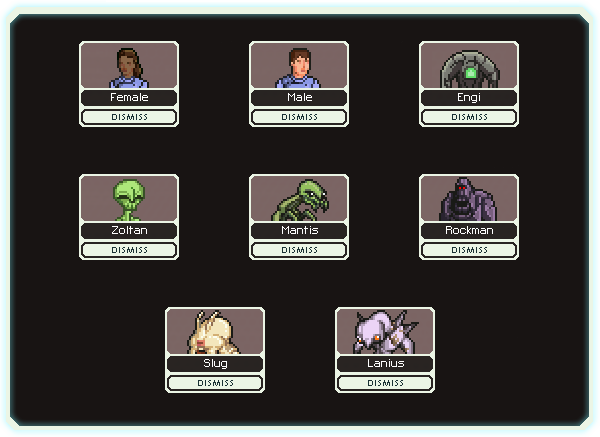 Tweevle wrote: I was inspired by the Detailed Crew Portrait Graphics Mod (by LordTrilobite) to make portraits based on my own interpretations of the races! Zoltan - bureaucratic greys, Slug - obese and eyeless, Rockmen - ape-like, Mantis - face-fingered. 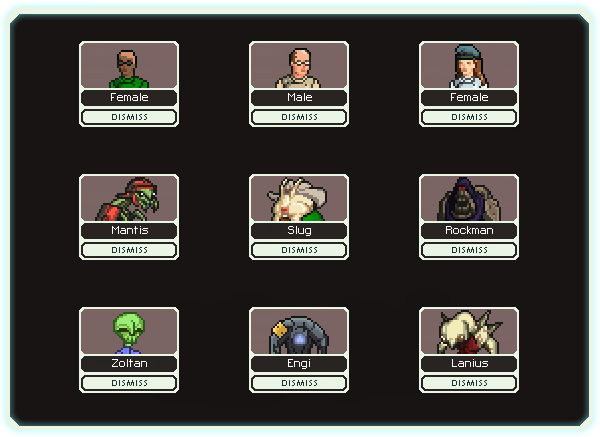 This mod is my (successful) attempt at putting Tweevle's crew portrait previews into the game. All of these portraits shown above were made by Tweevle, with the exception of the engi portrait and its accessories because Tweevle never released his engi portrait. Thanks to Bamalf for some constructive feedback and Corn for the improved engi portrait. And now introducing: the accessorised edition. This version uses accessories that were in Tweevle's previews, but I initially decided not to include to fit the style of a crew portrait mod. These accessories include monk robes for rockmen, western style hats for slugs, roman style armour for mantis and a plethora of human hair styles and glasses. The accessorised version also adds new colours and replaces the vanilla names with new ones so the chances of getting male and female sprites/names are equally likely. And yes, these accessories are also seen on ship. You can download the standard version here. And the accessorised version here. And you can download a remastered GUI patch here as requested by Corn. This patch can also be used with LordTribolite's version. And of course, like with LordTrilobite's version, these mods are NOT COMPATIBLE with any mod that replaces crew files, including the three big overhaul mods. I might make separate versions for the overhaul mods. Last edited by Jumbocarrot0 on Mon Apr 22, 2019 4:20 am, edited 7 times in total. I know but I'm no artist. Thanks for the feedback though! I tried to make it a similar style of using the colour palete from the crew sprites. I've been working on some engi portrait variations and just want some opinions before making a final design. I'm not an artist too, but maybe it will be something like this (it is a little modified official art). bamalf wrote: I'm not an artist too, but maybe it will be something like this (it is a little modified official art). The one on the far left is the new one and the other three are for comparison. New update implements the new engi portrait shown above and an accessorised version of the mod with accessories shown from Tweevle's Previews is now a separate mod. The accessorised version also adds new colours and replaces the vanilla names with new names for the main purpose to have an equal chance of having male and female sprites. Corn wrote: Hello. Your mod is looking great. But the hat for slugs does not look very good in my opinion, can you look at my version of the hat on the link: [link] (colors for the hat are taken arbitrarily). Base picture for hat was slugs portret in your mod. Sorry for not looking at these earlier, I was caught up irl. And also thank you for taking interest into this mod enough to want to improve it, that is greatly appreciated. As for your accessories, they look great! I would be more then happy to include them into the accessories edition, with credit of course. I will update the mod in due time with your accessories and some other accessories which I, forgot to include. Corn's excellent sprites for rockman robes, slug hats and the engi portrait. Some improvements on the colours based on Corn's opinions on the matter. A new Remastered GUI patch that changes one changed asset used in the base mod to the remastered style. 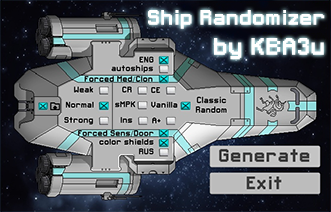 Used in conjunction with any remastered GUI mods. Hi, Im new to this so sorry if this is a dumb question. But you're saying I can't install this with CE then? As that's an overhaul mod that changes crew portraits? I think this mod looks awesome and would love it to work with CE.